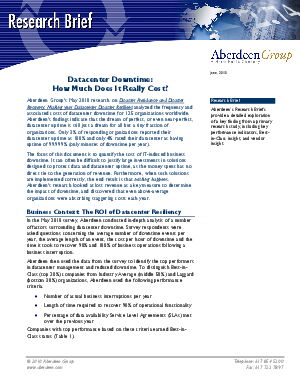 > Aberdeen Group > Datacenter Downtime: How Much Does It Really Cost? The focus of this paper is to quantify the cost of IT-induced business downtime. It can often be difficult to justify large investments in solutions designed to protect data and datacenter uptime, as the money spent has no direct tie to the generation of revenue. Furthermore, when such solutions are implemented correctly, the end result is that nothing happens. Aberdeen's research looked at lost revenue as a key measure to determine impact of downtime, and discovered that even above-average organizations were absorbing staggering costs each year.